For the past number of years, (approximately 20), Stocks Manufacturing has been building and selling the "highest security bicycle lock" in the industry. The earliest model was featured in Bicycle Retailer magazine in the late 1980's and has since been the subject of a great deal of attention throughout the industry both locally and world-wide. While the owners have attended a number of industry-specific trade shows in Canada , the United States and Europe , the lack of funds and therefor the inability to mount any "real" impact on the market place has been limited. The net result has been to keep the production of Stocks Products, which now number ten SKU's, in the category of a "hobby" enterprise. Stocks Manufacturing has been featured in many publications including the National Post, Urban Bikers',as well as several Canadian publications dealing with the Cycling Industry (note: Canadian Cyclist reviewed the Stocks Lock in our first issue, and a number of times since). 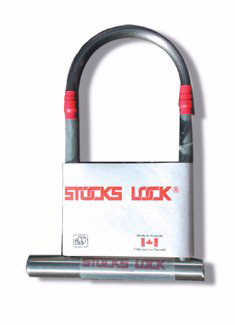 A Toronto, Ontario newspaper featured the Stocks Lock as the best alternative to other locks during the "Bic pen/cylinder" lock crises earlier this decade! The Stocks Lock is still at the top in quality and reliability and continues to boast only TWO known or claimed thefts in it's history! There have been many attempts at violating a Stocks Lock, but 99 and 99/100's of a percent have failed! The owner of Stocks Manufacturing is about to retire from his business endeavors and does not want the "best flexible U lock" in the world to retire with him. Some of the "big" manufacturers have tried to clone the Stocks Lock during the past number of years but the interest disappeared when they were unable to make the technology work. The technology and the "know-how" are available.